Paracas Natural Reserve – One of the biggest protected deserts in the Americas – incredible views of desert meeting the ocean. 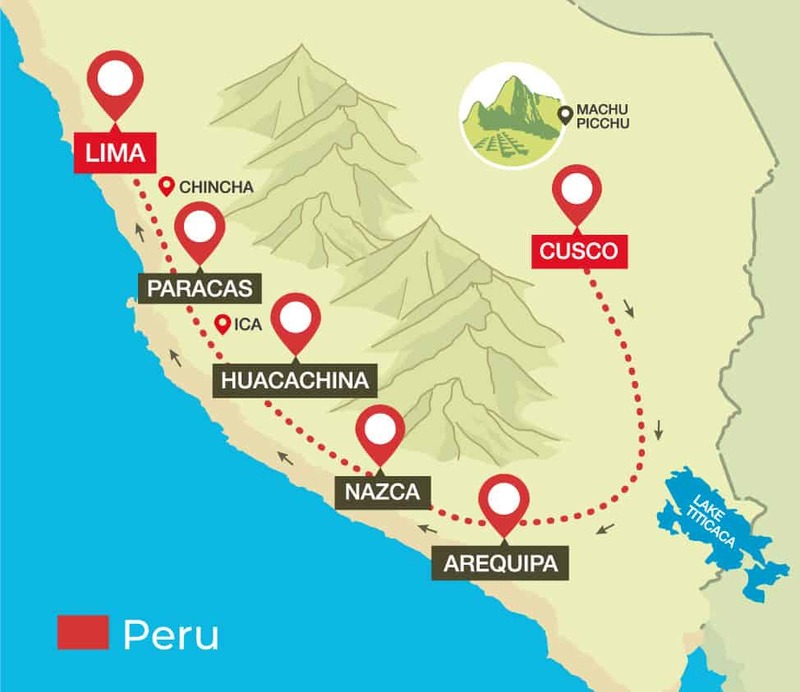 After the wonderful white city of Arequipa, it’s time to move further up Peru towards the incredibly hot and picturesque Huacachina. But first, enjoy seeing the famous Nazca lines for yourself from the viewing tower free with your Peru Hop pass. Paracas is only a short one hour 15 min journey from Huacachina but feels like travelling from one paradise to another. Leave the only desert oasis in all of South America and arrive at the quaint cultural home of the National Reserve. Take a tour of a boutique Pisco vineyard to discover how Pisco, the national drink of Peru, is made. Best of all, get lots of free samples of pure pisco, sweet wine, and Pisco baileys! The tour begins at 11:00am so we will do the tour during the day and return to Huacachina for some time before departing at 18:30pm to Paracas. Paracas is a small town, where the bus can only drive on one street. Hotel Frayles is our drop-off point – 1 minute walk from all popular hotels and hostels. Finally, leave the hot relaxing beach town of Paracas for the huge busy city by the sea, Lima. Only 4 hours away but like entering a whole new world. See for yourself where the desert meets the sea at Paracas National Reserve on our way back to Lima. Check out our Instagram for some pics of this unbelievable spot that comes free with your Peru Hop wristband. Before arriving in Lima, we’ll have one more stop at the most fascinating, historical spot yet – Tambo Colorado. 3 acres of Incan ruins located near the coast once a fortress and administrative site between the coast and the highlands! AREQUIPA PICK-UPS: Between 05:15-05:45am. Be ready at reception at 05:15am. MAIN ACTIVITY IN PARACAS: Ballestas Islands – 2 Hour Tours begin at 10:00am.